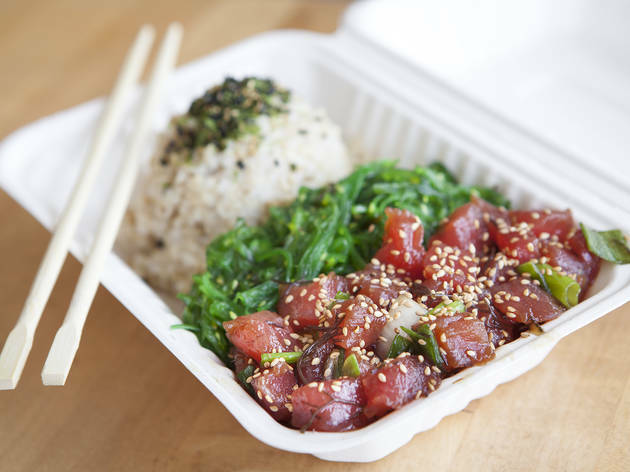 The lunch hour crowd flocks to Jus’ Poke’s glistening fish-lined deli case as if marinated poke is a vital nutrient to carry out the workday (it very well could be). You’ll want to come hungry. 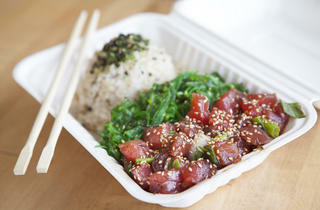 Score generous portions of original (traditional marinade), spicy, shoyu, wasabi or California roll poke (cucumber, tobiko, avocado and imitation crab) with rice and a side for $8 (regular) or $14 (large). But more than the perfect combination of buttery fish and crunchy onion, the translucent deli case is home to equally palatable sides included with each bowl. Choose from spicy edamame, seaweed salad, pickled cucumbers, Hawaiian chips and more for the ultimate complementary bite to your fishing expedition. Seal the mouthwatering deal with a classic scoop of coconut pineapple or green tea ice cream.